A report into the "missing plane" from last year has been completed and an interim copy released. The biggest bombshell? The great expense in hunting for the plane's locator was all for naught: the battery expired a year before the plane even took off. You can read the actual report here, if you don't want to read through media (or my) reports. I haven't really written about this stupid plane before: when it was the big worldwide story last year I didn't pay it a lot of attention. I knew the basics, which the report covers fairly nicely (if a bit technical, for those who don't remember playing Flight Simulator back in the day). The disappearance of the radar position symbol of MH370 was captured by the KL ATCC radar at time 1721:13 UTC [0121:13 MYT]. Military radar and radar sources from two other countries, namely Vietnam and Thailand, also captured the disappearance of the radar position symbol of MH370 at about the same time. This would be the infamous disappearance of the plane. At first blush, this would have seemed to be where the plane went down, but of course we know now that the story was much more complicated. At 1721:13 UTC [0121:13 MYT] the Military radar showed the radar return of MH370 turning right but almost immediately making a constant left turn to a South Westerly direction. At 1730:35 UTC [0130:35 MYT] to 1735UTC [0135 MYT] the radar return was on heading 231 magnetic (M), ground speed of 496 knots (kt.) and registered height of 35,700 ft.
At 1736 UTC [0136 MYT to 1736:40 UTC [0136:40 MYT] heading was 237M, ground speed fluctuation between 494 and 525 kt. and height fluctuation between 31,100 and 33,000 ft.
At 1739:59 UTC [0139:59 MYT] heading was 244M, ground speed 529 kt. and height at 32,800 ft.
At 1752:35 UTC [0152:35 MYT] radar return was observed to be slightly south of Penang Island. It was noted by the Investigation Team that the position and heading of the radar return from both Civilian and Military Radar, suggested that it was from the same target. After the last radar return disappeared from KL ATCC Primary Radar at 1752:35 UTC [0152:35 MYT], the Military Radar continued to track this radar return as it headed towards Pulau Perak, a small island over the Straits of Malacca. The time registered over Pulau Perak was 1802:59 UTC [0202:59]. The tracking by the Military continued as the radar return was observed to be heading towards waypoint MEKAR, a waypoint on Airways N571 when it disappeared abruptly at 1822:12 UTC [0222:12 MYT],10 nautical miles (Nm) after waypoint MEKAR. This would be the various military radars catching MH370 after its transponder was turned off and the plane "went dark". About this same time, the plane began jigging and assumed a new course, likely the southward route that led it deep into the Indian Ocean. The Captain’s ability to handle stress at work and home was good. There was no known history of apathy, anxiety, or irritability. There were no significant changes in his life style, interpersonal conflict or family stresses. But Shah was also seeing another woman — and that relationship was reportedly also in trouble, the friend said. On studying the Captain’s behavioural pattern on CCTV recordings on the day of the flight and prior 3 flights there was no significant behavioural changes observed. On all the CCTV recordings the appearance was similar, i.e. well groomed and attired. The gait, posture, facial expressions and mannerism were his normal characteristics. The plane is, as you might have expected, in good condition. There was a minor collision in Shanghai back in 2012, which was the only incident report filed against the vehicle. A review of the Mandatory Occurrence Reports (MORs) for the B777 fleet raised by the Engineering & Maintenance Quality Assurance Department of MAS revealed that only one was raised for 9M-MRO, and this was related to the right wing tip damage stated above. A total of 77 MORs were raised for the MAS fleet of 17 B777 aircraft. MORs raised by the Quality Assurance department are primarily related to technical issues with the fleet. The average age of the B777 fleet as of 01 March 2014 was 14.35 years. 9M-MRO was 11.75 years old. MH-370 had four ELTs installed: one in the roof of the aft passenger compartment, one portable one in a closet in the forward cabin, and two ELTs on two of the slides that turn into rafts in those cool graphics on the safety card you never look at anymore. The batteries for these ELTs were all good with expiration dates in November 2014 or later, for all the good they would do. The Cospas-Sarsat system does not provide a complete coverage of the earth at all times. As a consequence, beacons located outside the areas covered by these satellites at a given moment cannot be immediately detected, and must continue to transmit until a satellite passes overhead. Cospas-Sarsat (that's not easy to say!) also doesn't detect anything other than the 406MHz distress signal, not the 121.5MHz one. Lower frequency waves in general travel further through the atmosphere than their high-frequency counterparts, meaning that tge 406MHZ signal is less likely to make it to the satellite in the first place. The SSCVR ULB battery however was replaced, as scheduled, with the next expiry in June 2014. There is some extra margin in the design to account for battery life variability and ensure that the unit will meet the minimum requirement. However, once beyond the expiry date, the ULB effectiveness decreases so it may operate, for a reduced time period until it finally discharges. While there is a definite possibility that a ULB, will operate past the expiry date on the device, it is not guaranteed that it will work or that it would meet the 30-day minimum requirement. There is also limited assurance that the nature of the signal (characteristics such as frequency and power) will remain within specification when battery voltage drops below the nominal 30-day level. While it certainly wouldn't help that one of the two "black boxes" didn't have a fresh battery, it seems unlikely that the failure to detect any ULB signals can be blamed on the battery alone. In a brief Google search, I haven't found any instances where only one black box has been recovered, meaning that it's highly unlikely that the SSCVR "black box" -- which had a fresh battery -- wouldn't have been discoverable at the time its twin was unavailable. Oddly enough, it's a 9/11 conspiracy busting site (go figure) that has the most comprehensive single page outlying cases where black boxes haven't been recovered. There's never been a case where one could be found while another was lost. Hey, remember how I started off this post? That fact was endlessly reported in the media: too bad it isn't true. Only one of the two locator batteries was expired. Expired batteries may have still performed. The story being passed off in the press doesn't match the (interim) report. MAS holds an Air Service Licence (ASL) and Air Operators Certificate (AOC) for scheduled and non-scheduled operations. It was public listed in 1985 with the Government holding a golden share. At its peak, MAS was having an extensive network of operations with more than 100 destinations spanning over 5 continents around the world. The recession in 1994 affected the airline’s business significantly when the operations were drastically scaled down. In spite of its scaled down operations it is still a fairy large organisation (Figure 1.17D below shows the Organisation Structure of MAS), with a staff strength of more than 20,000 employees. All that we heard about in the wake of MH-370 (and the Ukranian missile incident, which of course is just a freak coincidence) was their above-average safety record. If the finances are mentioned, it's usually an aside into a story about the airline's future. The report also mentions a couple interesting quirks regarding Air Traffic Control (ATC) activities on the day MH-370 disappeared. The last radio transmission between KL ATCC and MH370 took place at 1719:30 UTC [0119:30 MYT]. A contact should have occurred at around 1722 UTC [0122 MYT] when passing the waypoint IGARI. The first DETRESFA11 message was transmitted by KL ARCC at 2232 UTC [0632 MYT]. Thus a total of 5 hours and 13 minutes had passed by between the last message expected from the crew and the transmission of the first message triggering the Distress Phase12. It was only at 0330 UTC [1130 MYT] on 08 Mach 2014 that Malaysian aircraft took off heading to the search areas. As the ‘custodian’ of the airspace, the KL ATCC was the key witness to the event, having transferred MH370 to HCM ATCC 3 minutes before the estimated time of arrival (ETA) over the Transfer of Control Point13 (TCP). The estimate14 of the aircraft for IGARI which was 1722 UTC [0122 MYT] had been passed to, by KL ATCC, and duly acknowledged by HCM ATCC, as stipulated in the Operational Letter of Agreement between DCA Malaysia and Viet Nam Air Traffic Management. The Operational Letter of Agreement between DCA Malaysia and Viet Nam Air Traffic Management stipulated that “the accepting unit shall notify the transferring unit if two-way communication is not established within five (5) minutes of the estimated time over the TCP”. 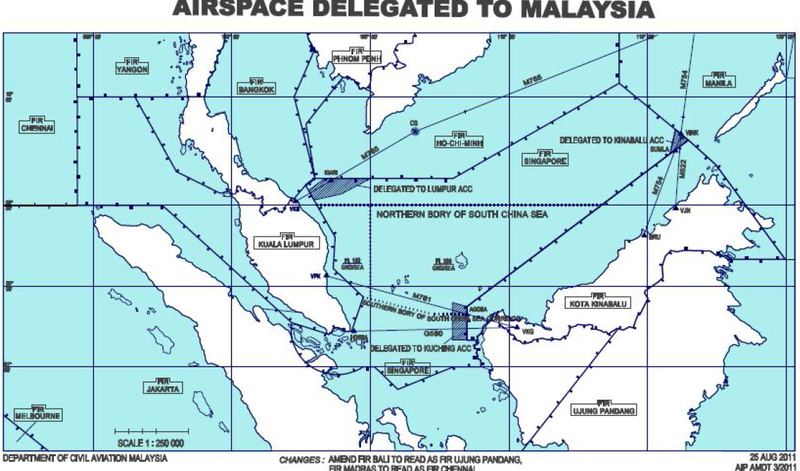 At 1739:03 UTC [0139:03 MYT] HCM ATCC queried KL ATCC for news on the MH370. After MH370 was transferred to HCM ATCC, the time of transfer was not recorded manually on the paper Flight Progress Strip as stipulated in MATS Part 2-Gen Section 11 FLIGHT PROGRESS STRIPS. Event that followed was at time 1804:39 UTC [0204:39 MYT] KL ATCC Radar controller informed HCM ACC; “…reference to the company Malaysian Airlines the aircraft is still flying, is over somewhere over Cambodia”. 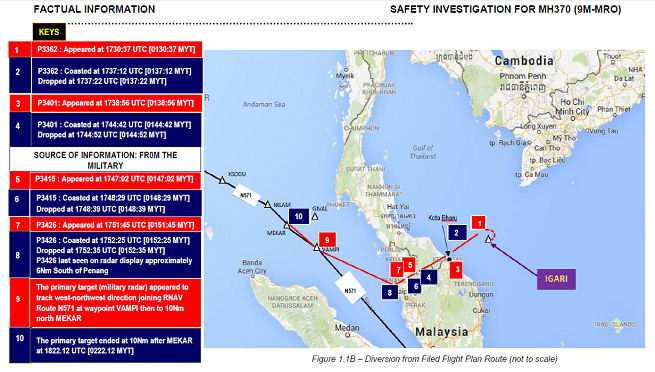 And thirty one minutes later, at time1835:52 UTC [0235:52 MYT] MAS Operations Centre informed the position of the aircraft was at latitude N14.9 0000 and longitude E109 15500, which was somewhere east of Vietnam and this information was relayed to HCM ACC. In retrospect, MH-370 appeared determined not to be found, so it's unlikely that this incident, though unfortunate, in any way impeded discovery of the plane. It gave them early inaccurate information about MH-370, but the later information was equally inaccurate. The plane's cargo has also been scrutinized, particularly the Lithium Ion batteries that were on board. The shipment did not go through secuirty screening in Penang but was inspected physically by MASKargo personnel and went through Custom’s inspection and clearance before the truck was sealed and allowed to leave the Penang Cargo Complex. The shipment arrived at KLIA Cargo Complex on the evening of 07 March 2014 before being loaded onto MH370 without going through additional security screening. Both of the batteries were not regulated as Dangerous Goods because the packing adhered to the guidelines as per Lithium Battery Guidance Document (3. Section II - Packing Instructions 965-970). This document is based on the provisions set out in the 2013-2014 Edition of the ICAO Technical Instructions for Safe Transport of Dangerous Goods by Air and the 55th Edition of the IATA Dangerous Goods Regulations (DGR). While the British press leaped on the batteries as dangerous, the IATA rules trump Fleet Street. Especially since, as anybody versed even remotely in IATA rules knows, they seriously error on the side of caution. If something isn't IATA Regulated, it's safer than baby oil (and yes, I did double check that baby oil doesn't have a UN number). The mangosteen fruit on-board, as you might guess, is also not dangerous. There's only one non-appendix tidbit in the report left to cover, and it pretty much covers it all, doesn't it? Not applicable at this stage of the investigation.